While we were visiting our daughter in Florida recently, we watched a compelling documentary about a sick and overweight Australian businessman who came to the USA to perform a juice fast for 60 days. See here. It was fascinating to watch as the man, Joe Cross, traveled all over The US and stopped at farmers markets or roadside stands. In the rear of his vehicle he had a juicer and would juice the vegetables right on the spot. He checked with his MD before he began and hoped to eventually eliminate the prescribed medicine for his skin disease which was making him sicker. Cross was losing fat, little by little. He would speak to other young people about their diet and they would mention the usual fast- food fare. A couple of people looked like they could have benefited from the juice regimen, but said they loved their junk food too much. Cross kept juicing twice a day, and eating nothing else. His fat continued to diminish and after tests with his physician, he could actually drop the medicine routine and its side effects. Driving through Arizona, Joe Cross met an obese over the road driver and started talking with him. The man had trouble walking from his rig to the truck-stop center. Joe invited him over to his vehicle and offered him a glass of juice. They got to talking and it turned out both men had the same disease. The trucker liked the beverage but wasn’t sure about committing to a juicing program. Joe left his number with the trucker. At the end of the 60 day juicing program, Joe was no longer fat, sick and nearly dying. He was no longer taking the medicine and his disease had completely cleared up. He went back home and went about his business. Later, that obese trucker telephoned Joe and asked for help. Joe agreed to return and provide help. The driver, although in his early 40’s, could barely walk a block without having to stop. When he was younger he was a champion swimmer in school. He followed Joe Cross’s advice and through the ensuing weeks lost a lot of fat and was able to jog long distances. He was so grateful he started volunteering to help other overweight people. My daughter wanted me and my spouse to start juicing and purchased a juicer for us that day. We bought a bunch of vegetables and started juicing. 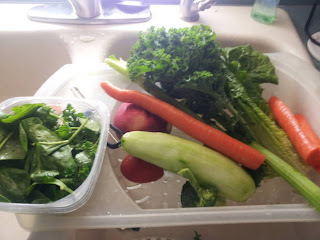 The Education Tipster likes it and participates in the twice daily juicing event. My daughter urges everyone to start juicing, as the concentrated nutrients (vitamins, minerals, enzymes etc) help stave off food cravings as they satisfy your body’s food needs. There are a couple of important points to remember. Wash the vegetables and fruit to be juiced. Do include a little fruit with the vegetables for a more palatable flavour. Rinse out the juicer as soon as possible, before it gets dry and is hard to clean. Drink the juice as soon as you can, before oxidation sets in. We traveled over 130 miles round trip to buy some Bitter Melon, which is a bitter vegetable reputed to be very effective in controlling blood sugar. After awhile you can get used to the amounts and varieties of fruits and vegetables you may prefer. I use bitter melon with carrot, celery, spinach, bell pepper, zucchini, cucumber and a little watermelon, apple and orange. You can juice almost anything, but not banana or avocado.Read the manual accompanying your juicing machine for more information. We met a Russian man at that market who has been juicing for 15 years, since he got here. He looked very healthy. Here is a simple juicing recipe to get started: 3 carrots, 1 tomato and a handful of spinach. It tastes like V8 juice, but its much better for you because it contains live micronutrients and no preservatives. occasional juices are damn interesting but focused purpose driven juicing can be difficult! good to know so many have been benefiting! am neck deep in work and only slowly wending my way back to blog!! THE JUNKIE BOOK: You're right, regular juicing requires commitment. I'm not juice-fasting but am eating lightly. We intend to eventually go to just one juice drink per day. Happy to hear you are not unemployed. I am well, hope you are also. That was a nice post on juicing. I have heard a lot about it great to know from you that it really works.. Very useful info indeed. It is really great to know some useful stuff. KAVERI: I don't want to just have the juice and no food. We drink the juice in the morning and evening and eat light meals also. I would urge you to drink one glass of juice daily as an adjunct to your normal diet. DAWN@: Thank you for calling, I appreciate your humour. UMA: Thank You, very ind of you to say so. Wow...this is an incredible story. These seem like very brave people. We bought a HealthMaster (Montel Williams) for a $100. Its okay. I think its a glorifies blender as all it does as make a blend or puree out of everything. But we make smoothies with it all the time. Add protein powder and yogurt to whatever juice and fruit you have along with a few veggies and ice and you have a delcious and nutitous meal. STEPHEN: We have a "Jack LaLanne" and love it. Adding whey to drinks is great idea, flaxseed oil too. That's some story! Imagine traveling all that way . . . THE GOLDEN EAGLE: Yeah, it was a long trip but worth it. Started juicing last year its amazing isnt it? I love it! wow!!!! what a story!!! is that it? juice is all you need to lose weight??? really??? wow!!! im tempted to start juicing right away... i already have a glass of water melon juice everyday to up my iron levels.. but drinking just juice all day is something wonderful and something i would love to do... hmmm... im seriously considering it now... and its so easy... no more rushed mornings... or cooking dinner in the nights.. just juice! what an interesting story Anthony.....very educational and inspiring .....thanks for sharing! Might need it after the christmas holiday :)bookmarked! I love the idea of ​​mixing fruits with vegetables, I already do sometimes salads. I do not juice a lot, but I do about once a week. I don't have the extra weight I want to lose. I like the juice as a snack in the afternoon. Reallly good. PEGASUSLEGEND: It is amazing. We are almost able now to cut out that stupid after dinner snacking fiasco that raised our weights. I'm fully committed to juicing and when we get our weight and the tipsters blood sugar under control will probably juice once daily. TORVIEWTORONTO: You are right, juicing adds concentrated amounts of nutrients, you just have to watch the fruit sugars. That dinosauer cake was super-cute. Regards. SARAH: Whoa, wait a minute now. A "juice fast" and no solid food for a defined length of time will let you lose weight. No, you cannot drink juice "all day", you have one glass in the morning and one in the evening. You have to commit to juicing because you have to clean and trim the vegetables and clean the juicer when juicing is complete. It's no big deal only takes a couple minutes. Yes, juicing fasts are a proven, medically safe (you should communicate with your doctor, although many will be a little negative) way to eliminate fat and get fit. Watch that documentary if you can it will reinforce your commitment. A little physical exercise will give tone to your body too. I must say that I really appreciate your enthusiasm. If you could apply that to our nations debt, we would soon have a surplus. CAYSERA: You are absolutely correct. A glass of fresh juice once a week is good for you if you don't want to do it regularly. LEOVI: Yeah I like to use fruit in salads too. MY JOURNEY: Thats good, we feel better right after we drink the fresh juice. Very interesting and great information. Curious...probably would be redundant to juice that lemon meringue pie, huh? AL: Juicing that pie would be superfluous if not redundant or at least excessive if not unnecessary. Though it's been awhile, I love juicing. Must be time to dust off my machine. JAY: Thank You for those complementary words. GENE POOL: Juicing is a good thing, thanks for calling. SONALI: I am happy that you appreciate it, Thank You. I've heard about juicing, but not the overall use of it for dieting. If you are on a juice fast, where does your protein come from? ELLEN: Juicing fasts are as water fasts; the difference being the nutrients in the juice. I would expect there is little protein in the juice. Without protein your lean body mass may give up protein. North Americans usually ingest far more protein than needed, the extra turns to stored fat. At the completion of the fast the body mass will return to normal. When Joe Cross (the juicer in the documentary) juice fasted for 60 days, he looked great. The lack of protein didn't impact him. The Tipster and I juice twice daily but we also eat lighter meals. If protein were a concern, (say to a bodybuilder juice fasting), I would say add some powdered whey to the juice drink. Water only fasting goes way back to biblical times, 40 not 60 days though, and no one complained. I appreciate your question Ellen because it made me think. Funny though, you didn't ask where does your fat come from. Fat is a necessary food group too. Thanks Anthony... will try out one glass in the morning and one in the night... but we need to have regular food along with it right? SARAH: You will notice the difference and yes, eat regular food as well.